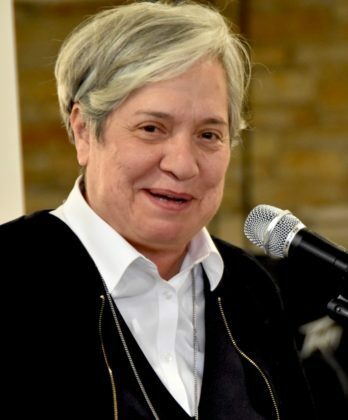 “We are restoring humanity,” is how Sr. Norma Pimentel, MJ, describes the work that she and others do at the Humanitarian Respite Center in McAllen, Texas. 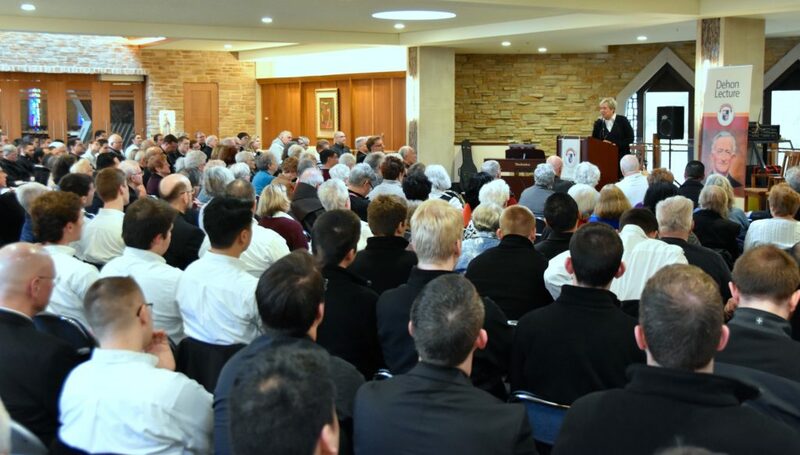 Executive director of Catholic Charities of the Rio Grande Valley, Sr. Norma was the main speaker at the Dehon Lecture at Sacred Heart Seminary and School of Theology on April 10. Since 2014, she and volunteers from every faith community in the area, plus civic and business leaders, have assisted migrants on their asylum journey. She insists that it is the responsibility of all Americans to help in this migration crisis. Sr. Norma begins her call to others by sharing her own story, starting with her vocation to religious life. As a child, she loved art and had aptitude for it; she hoped to one day get a degree in fine arts. In the midst of trying to find a way to make her dreams of college a reality, she agreed to go to a prayer meeting with friends. “They were going to Pizza Hut after; that was really my motivation,” she laughed. During that meeting “God introduced Himself to me,” she said. 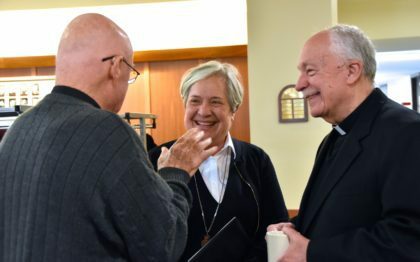 “It’s hard to explain, but from that moment on I wanted to be immersed in His presence.” She met a religious sister who invited her to a vocation retreat and didn’t look back. A few years later, she joined the Missionaries of Jesus. The religious community is located near the US-Mexican border and often was asked by border patrol agencies to assist in caring for migrant families. “From day one these migrants were a part of my religious life,” she said. Sr. Norma heard their stories, knew of the atrocities that many faced in the midst of violence and war. When she was asked to join a group that was protesting US support of some of the situations that led to conflict in Central America, Sr. Norma agreed and went to the congressman’s office where the protest was taking place. But instead of seeing the congressman, she saw the police who told the protesters to leave or they would be arrested. One of her fellow sisters said that they couldn’t just run away when things got difficult, otherwise “we really don’t stand for anything or anyone.” Sr. Norma thought of the many refugees she had met, the people whose lives had been directly impacted by civil unrest. And so she stood her ground in the face of the police “and that was very hard for me, it went against everything that I was taught,” she said. “I was raised to obey the law and if an officer told me to move, I moved. “That moment defined me, helped me know who I am. I realized that I had a mission in life. I knew that I had to stand up and speak to what I thought was right. Throughout the day of the Dehon Lecture, participants heard the stories of other migrants. During the midday Mass, Fr. 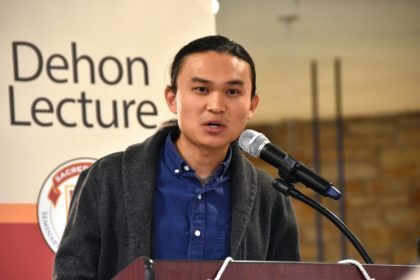 Vien Nguyen, SCJ, shared his own story. As did Sr. Norma, Fr. Vien invited all people to respond to the current migration crisis and to do so because of their Christian faith. Click here to read Fr. 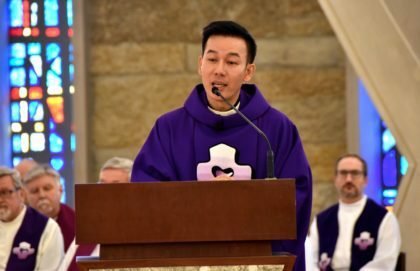 Vien’s full homily. The Dehon Lecture concluded with a panel discussion in which four diverse people shared their immigration stories including Frater Paul (Phong) Hoang, an SCJ seminarian who, like Fr. Vien, is a Vietnamese immigrant; Regina Bakala, an immigrant from the Democratic Republic of Congo who was nearly deported back to the country where she and her husband had been tortured; Irma Melchor, an immigrant from Mexico, and Fr. José Gonzalez, a Milwaukee priest who served as Irma’s translator and who also shared his own story of being impacted by the concerns of migrants. He has served in Hispanic ministry in Milwaukee and is also an associate director of Human and Spiritual Formation at SHSST.